The wonder-material graphene could hold the key to unlocking the next generation of advanced, early stage lung cancer diagnosis. A team of scientists from the University of Exeter has developed a new technique that could create a highly sensitive graphene biosensor with the capability to detect molecules of the most common lung cancer biomarkers. The new biosensor design could revolutionise existing electronic nose (e-nose) devices, that identify specific components of a specific vapour mixture—for example a person's breath—and analyses its chemical make-up to identify the cause. The research team believe the newly developed device displays the potential to identify specific lung cancer markers at the earliest possible stage, in a convenient and reusable way—making it both cost-effective and highly beneficial for health service providers worldwide. The research is published in the Royal Society of Chemistry's peer-reviewed journal Nanoscale. 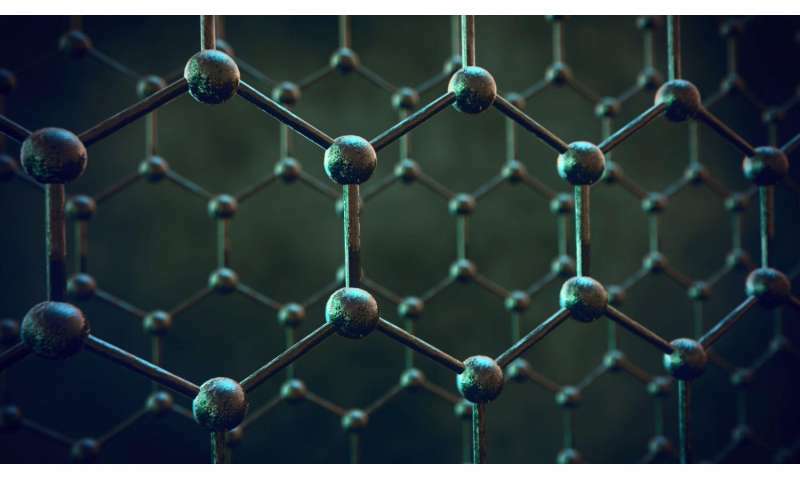 Ben Hogan, a postgraduate researcher from the University of Exeter and co-author of the paper explained: "The new biosensors which we have developed show that graphene has significant potential for use as an electrode in e-nose devices. For the first time, we have shown that with suitable patterning graphene can be used as a specific, selective and sensitive detector for biomarkers. "We believe that with further development of our devices, a cheap, reusable and accurate breath test for early-stage detection of lung cancer can become a reality. The quest to discover viable new techniques to accurately detect early-stage lung cancer is one of the greatest global health care challenges. Although it is one of the most common and aggressive cancers, killing around 1.4 million people worldwide each year, the lack of clinical symptoms in its early stages means many patients are not diagnosed until the latter stage, which makes it difficult to cure. Due to the unrestrainable nature of the abnormal cancer cells, while they begin in one or both lungs, they are prone to spread to other parts of the body rapidly. There are currently no cheap, simple, or widely available screening methods for early diagnosis of lung cancer. However, for the new research, the team from Exeter looked at whether graphene could form the basis for a new, enhanced biosensor device. Using multi-layered graphene, the team suggest that current e-nose devices—which combine electronic sensors with mechanisms for pattern recognition, such as a neural network—could revolutionise breath diagnostic techniques. Using patterned multi-layered graphene electrodes, the team were able to show greater sensing capabilities for three of the most common lung-cancer biomarkers—ethanol, isopropanol and acetone—across a range of different concentrations. The team believe this could be the first step towards creating new, improved and cheaper e-nose devices that could give the earliest possible lung-cancer diagnosis. Multi-layer graphene as a selective detector for future lung cancer biosensing platforms is published in the journal Nanoscale.